It has been a tough year for Europe. Greece, mass migration and terrorism are among the many factors which have unsettled Europe in a profound way. When the EU is seen to stutter and stumble from one crisis to another, what the EU stands for, and what the EU is all about, are questions that become of great significance. Perhaps it is just an end of year reflection, but there does seem to be something profoundly cumulative about the pressures on the EU. Empires fall, countries collapse, and regimes break when they come under multiple pressures which pile on difficulties of growing complexity. When this complexity outstrips the steering capacity of such entities they tend to crumble and give way to new historical forms. Is the EU now in this position? Steering capacity comprises a number of different things. It requires having the governance mechanisms to resolve pressing problems, and the cultural and symbolic goods which bind a population together. In the case of the European Union, its governance mechanisms have typically been well adapted to a world of rising prosperity. The postwar boom assisted Europe’s development such that all countries could rise simultaneously. The European community was, moreover, bound together in the postwar years because of two crucial social and symbolic experiences. The first of these was the Second World War and its catastrophic legacy. The second was the Cold War which gave Europe a strong sense of negative integration. But when the Cold War came to an end and the threat of the Soviet Union was over, what would bind Europe into the future? In the 1990s and early 2000s, faced with mounting economic and social difficulties, the EU needed positive ideals and norms of integration, such as commitments to social justice, sustainability and well-being, which were too often either latent or absent. Relying on the negative leads to difficulties, and when things get tough and problems persist contested issues arise. Under these circumstances, distributional struggles typically intensify, mutual gain gives way to zero-sum, and the social order risks fragmentation and sectional struggle. The EU faces a series of crises which together threaten the infrastructure of the Union itself and ask deep questions about its steering abilities. In the first instance, the global financial crisis ricocheted through Europe creating many years of economic strain, sluggish growth, overhanging debts, and unemployment. As the global financial crisis became a Eurocrisis the balance sheets of many European states became strained to breaking point. European banks, buoyed by the fiction that risk had been equally distributed across the Eurozone and beyond, had bought large amounts of public and private debt from their neighbours and the US. As the economic crisis deepened, this debt became toxic and in many cases worthless. European states stepped in to socialise this debt and rapidly found their fiscal position in ruin. A vicious cycle of austerity and protest followed. The era of financial deregulation had come home to roost. If the crisis raised questions about the economic competence of the EU, the recent case of Greece created a watershed in EU economic and moral leadership. The Kantian project of a peaceful union of states that had been at war with each other for many centuries was premised on the Marshall plan which put resources in place for an exhausted Europe. Yet in insisting that Greece face its Versailles moment, the EU abdicated its moral vision in favour of punitive and restricting covenants. The paradox of this is that the one country that arguably benefited the most from the postwar settlement, Germany, became the country that insisted on austerity for Greece and a punitive settlement. Against this backdrop of economic pressure ‘European society’ (which had reached its zenith in the mid-1990s according to Euro-barometer data) began to experience intensifying contestation and division along nationalistic lines. In Greece the Golden Dawn gained a footing, in the UK UKIP rose to prominence, in France the National Front captured much support, in Denmark the Danish People’s Party continues to grow; and isolationist and xenophobic rhetoric became common place throughout the region. It is against this background that politicians struggle to cope with sudden and substantial migration flows into Europe; a struggle which compounds the sense that the EU’s fragile system of social integration is under pressure. While Chancellor Merkel’s commitment to opening the doors of Germany to refugees may be seen as a heroic stand in the tradition of humanitarian principles and human rights, this commitment is not shared by the overwhelming majority of European countries. The result is a kind of schizophrenia with respect to those who seek shelter in Europe. All EU attempts to establish an effective policy towards migration have failed, as flows continue to put pressure on multiple entry points into Europe from Spain to Italy, from Hungary to Greece. Some of these pressures have now become so great that these entry points are almost ungovernable. As hundreds of thousands of people pour into Europe from the south and east, what was previously described as the ‘Mediterranean Crisis’ quickly became a larger European refugee crisis which threatens to overwhelm existing EU policy. A deeper paradox underpins the crisis of contemporary migration in Europe. The flow of refugees are in many respects the other side of the failed 9/11 wars and persisting instability throughout the Middle East and North Africa. Although some European countries stood against these conflicts, many did not. The utter failure of the wars in Afghanistan, Iraq and Libya created vacuums in these countries into which brutal armed power has stepped. The people’s fleeing from North Africa, Iraq and now Syria come to Europe for help. Europe bears a direct responsibility for many of the catastrophic instabilities in their home countries. Yet, with the exception of, for example Germany and Sweden, the EU has buckled in the face of their suffering. Many of the security challenges in the world as a whole are now at Europe’s doorstep. Certainly, the terrorist violence that swept through Paris signals new security dilemmas which the EU finds hard to address. There is a significant discrepancy between the military capacity that Europe possesses and relies on and the security demands facing the region in the twenty first century. No amount of fighter jets and cruise missiles can prevent a small group of armed men from storming a concert hall. And yet, we still hear the eerily familiar war drums beating once again. Hollande’s call for a “pitiless war” to be fought against ISIL is a desperate repetition of the language we have come to know in the war on terror, so frequently uttered by Blair, Sarkozy and others. The vicious cycle of violence from 9/11 to increased airstrikes in Syria establishes an ever-escalating conflict and one which becomes ever more distant from a political resolution. But the problems go deeper. The decision to adopt a common currency in the EU allowed a radical increase in European economic interdependence. Some of this was planned and desired, such as the increase in intra-European trade and investment. Other elements were not foreseen. Most fatefully, as already noted, many large European banks began to collapse with consequences that ricocheted throughout Europe. Enhanced economic interdependence requires significant levels of political integration. The difficulty in the EU is that such integration runs into questions of political feasibility. In the short run, it required German taxpayers to agree to guarantee the borrowing of the Greek state and other debtor countries, and it required the debtors to borrow and spend in a way that is acceptable to German taxpayers. In the long run, greater fiscal coordination is required at the EU level. For some, this implies the EU’s capacity to enforce fiscal discipline. For others, it implies the EU’s capacity for fiscal transfers. The divergence between these perspectives is regularly on display in Brussels and across the continent. Such challenges, and any approach to finding effective solutions to them, rest on an uncertain foundation of European governance. The bedrock of Europe is etched with fault lines which under increasing pressure can quickly become fractures between the many communities and political centres that comprise the EU. Divisions open up within and between member states and threaten the promise of a cohesive and harmonious Europe. The EU, as its critics have often asserted, was created by European elites, albeit inspired by noble ideals. As the construct of elites, the EU has only had a shallow pool of legitimacy which too often rested on EU outputs; that is, economic success and stability. In democratic terms, the EU’s thin layer of legitimacy has few roots in the political fabric of the societies of member states. On top of this, many European decisions have all too often been the result of the struggle between the most powerful political interests, and today this increasingly takes the form of the interests of a dominant Germany. For these and many other reasons, EU decision making is often seen as bureaucratic, slow and difficult to accept, and far from accountable to EU citizens. Under pressure, as the EU is today, there is a clear risk that the political foundation of the whole project could come unstuck. European culture, like all cultures before it, cannot simply be the result of elite efforts. It has to be built on a foundation of common values and beliefs, which need to be cultivated over the long term. There were opportunities to set down these roots in the postwar period but they were rarely explored. It was easier for the leaders of Germany and France, along with their allies, to shape Europe in their own image and interest. European governance was always a compromise between the interests of its leading powers and rarely, if at all, the product of wide scale horizontal communication between peoples. The great projects of European cultural integration were above all projects of infrastructure and institution building. These are important, but they do not touch the fuzzy core of the complex patterns of national culture. This recognition makes it difficult to maintain a vision of Europe as a Kantian pacific union, as an example of pooled sovereignty and of how democratic rule can be elevated beyond the nation state. It is important not to lose sight of the fact that the EU has achieved much and, when times were good, went some way towards realising these ideals. But when faced with current difficulties the connective thread that binds the EU appears thinner and thinner. What was envisioned by the architects of the EU, and the elite celebrants of the project, was a thick and robust ideal of Europe. Whether or not the EU is at a tipping point now remains to be seen. Steering a way through the current constellation of crises is a sine qua non of salvaging the EU project. With steering capacity under pressure this will not be easy but recent EU attempts to reform and consolidate EU institutions may help. 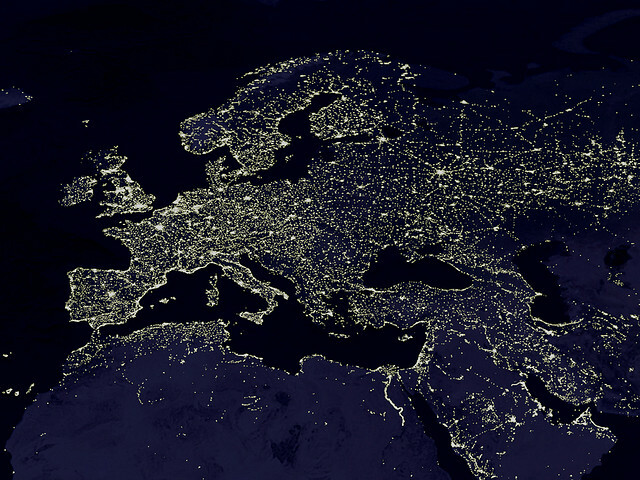 In the short term, Europe can only survive as a way of solving common problems. This remains a Europe worth having insofar as the EU stabilises crises and protects the economic wellbeing of its citizens. In the long run, however, the EU cannot survive without its thicker ideals, because without them Europe will have neither the political nor social integration to bind it together. This piece originally appeared on openDemocracy. Kyle McNally is a PhD candidate at Durham University and community editor of Global Policy. This entry was posted in Europe and tagged Crisis, EU, Euro crisis, European identity, European Public Sphere, Euroscepticism, immigration, refugees, UKIP. Bookmark the permalink.